Oysters are a prized delicacy, and while you can eat them cooked, they are often eaten raw. If you have a stomachache anywhere from a few hours to a few days after eating raw oysters, you may require medical treatment. The stomach pain can be the result of an allergy or because of food poisoning. In many cases, the pain will go away on its own, but you may still want to see a doctor just in case. 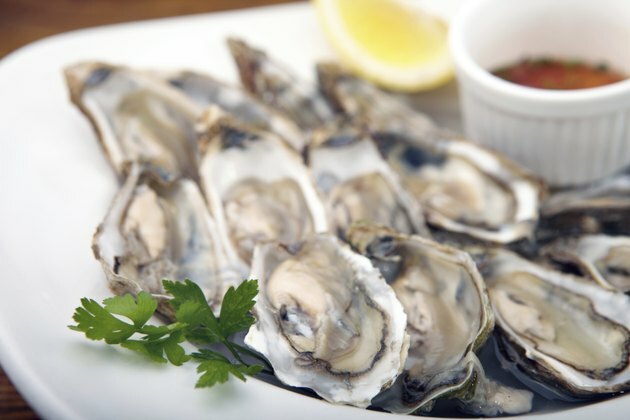 The most common cause of food poisoning in oysters is the vibrio bacteria. Most common in this genus are vibrio vulnificus and vibrio parahaemolyticus, both of which can cause stomach pain. As both of these bacteria survive well in warm waters and coastal areas -- areas where there are often large oyster farming operations -- oyster producers need to pay special attention to possible infection, which can occur even in sanitary growing conditions. The Centers for Disease Control and Prevention estimates 4,500 cases of vibrio parahaemolyticus infections per year and 900 cases of vibrio vulnificus infections between the years 1988 and 2006. If you have an oyster allergy, you likely have a mollusc allergy, which means other bivalves, such as mussels and clams, as well as cephalopods -- octopus and squid -- may be dangerous for you to eat. An allergy to oysters can cause stomach pains, possibly making you think that you have food poisoning. If you regularly experience stomach pains after eating shellfish, consult with a doctor to see if you have a food allergy. Even if all you experience are stomach pains, you should seek medical attention to be safe. However, in many cases, you will also develop other symptoms. With a food allergy, you may also experience trouble breathing, as well as dizziness or swelling in your mouth, lips and throat. In cases of a vibrio bacterial infection, you will likely experience diarrhea, vomiting, fever, chills, headache and possibly lowered blood pressure. Symptoms of a vibrio parahaemolyticus infection can occur within 24 hours and last for up to three days after the infection. The growing conditions for oysters and the finished product are subject to strict regulation, which can help make raw oysters safer to eat. Do not eat raw oysters if you have liver disease or a weakened immune system, as exposure to vibrio vulnificus can be life-threatening. Chances of a severe infection of vibrio parahaemolyticus are also increased for those with weakened immune systems. Raw oysters are also not recommended for pregnant women. Despite widespread belief in their effectiveness, alcohol and hot sauce, popular condiments for raw oysters, will not kill any deadly or harmful bacteria. Colder waters are less hospitable to vibrio bacteria, although infection is still possible.